At the same time, we began to build a house for toilets and supposedly for offices. Only problem was that as we were building, our team grew so big that we couldn’t fit it inside anyways. But we finished what we started and just found a new purpose for those rooms. Nowadays, we have teachings and English school for our staff and kids from the villages in there, Kids church uses the facilities for the smallest kids and it’s good as it is. Later, we built a huge roof with a tire playground and other features. 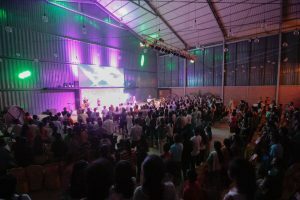 End of the year 2015, we moved the Kids church to the Campus, finally we could run again, play wilder, grow bigger, be louder. No neighbors were bothered anymore because, well, there is no neighbors. It kept being a big construction side, since we were depending on money, we could only build a cement floor a couple of months later. Followed by other installations such as bleachers, bigger speakers, etc. The kids didn’t care too much about the rough look, they came anyways, in need of love, fun, adventure, change of their daily life. They’re not picky. It’s easy to serve them. And we love doing it. 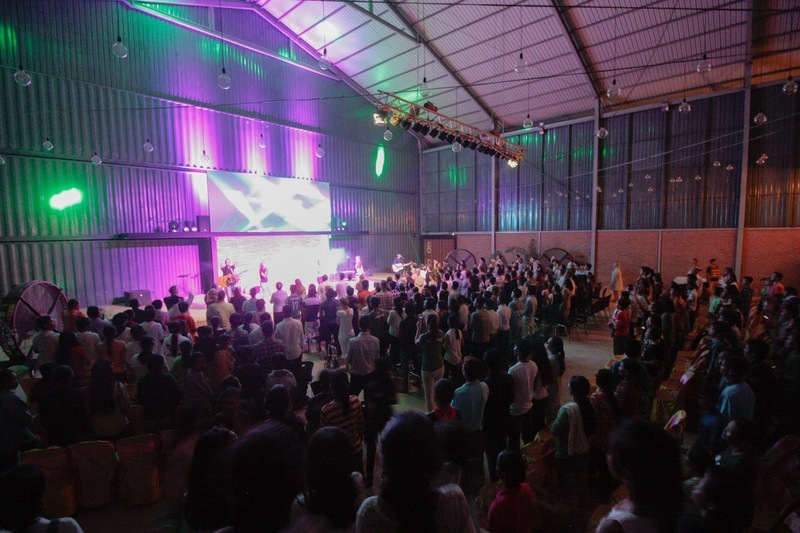 In August 2016 was our first Teenager celebration (ONEIGHTY) on the Campus. On several Saturdays, it rained that much, that all of us were soaking wet. But hey, this cannot stop us. We thought of solutions and decided to turn half of the big roof into a celebration hall. For the next couple of months, we raised the money we needed. This year, we built walls and a stage, bought more containers for storage, created a walkway plan and added many other necessities. Every week, it got better. Every week, something was new or different. Until finally in August this year, when we moved our last celebration – the one for adults – to the Campus. Finally we could breath again. Jump again. Dance again. It had become very crowded in our living room in the good old ICF Villa. And if I may be honest, since already a long time, I didn’t like it anymore. Call me biased, but the celebrations on the Campus are sooo. much. more. FUN. I’ve been waiting for this ever since I started working on the Campus in 2015. It was the big picture that kept me going even when I was upset and stressed out due to broken machines. That kept me dreaming of more vivid times when I felt isolated. That kept me running when problems occurred, timelines approached, the heat increased. That kept me trying when I felt frustrated due to language, culture and leadership problems with the locals. It was pure motivation to think that at some point it all was worth the sweat, the nerves, the effort – and hundreds of people will visit the Campus weekly – full of expectations and in order to get inspired, encouraged, and more. However, not everything worked out the way I wished. 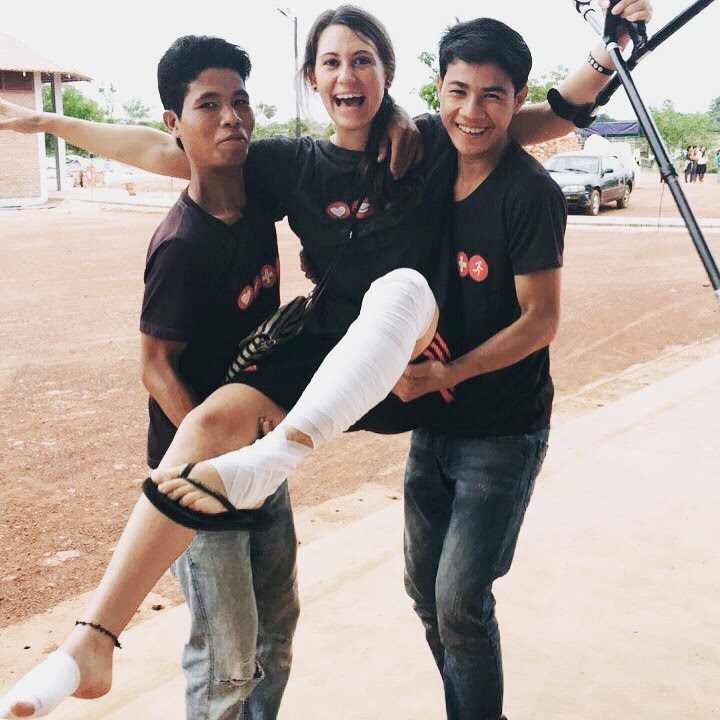 Two weeks before we held our first celebration on the Campus, I had a motorbike accident and hurt my foot badly, they had to stitch it 12 times – all around toes, etc. One ugly, deep flesh wound. (Yes, thanks God not worse.) Due to that, I wasn’t able to walk without sticks at first, let alone work on the Campus for quite some weeks. Needless to say, I wasn’t too happy. I had been sooo looking forward to the move and to the last-minute stress when we set up everything within a few days. You know, this atmosphere loaded with anticipation, that’s what I wanted to experience! And now, injured in bed at home, I could only listen to what was going on. It wasn’t a piece of cake for me. Many times, I caught myself wishing that the accident happened two weeks later. I was frustrated. Only on the first celebration, I realized that the wound was the only way to keep me in my seat, to make me enjoy the celebration, to make me watch instead of work. Not that I ever wanted that, but it was truly an interesting experience. My team members were gold, they carried me, would serve me food and did everything to make me happy. And the evening was definitely a success! Some weeks later, we had the Grand Opening. I still wasn’t 100% back yet. However, this is when you realize what awesome team stands behind you – they rock! We honored Koni and Barbara who had invested so much time, money, effort into that one withered meadow. They are a blessing to us as ICF Cambodia, as Campus team and also to me personally. I still don’t know why Koni came up with the idea to entrust me leading the construction team three years ago. Me – that time I had just barely reached 20 years of age, had no experience in leadership, let alone construction work. I mean, the only thing I had accomplished until then was my apprenticeship – in the office, by the way. Far away from any construction side. However, Koni always believed in me and my human sense and pushed me to go waaay beyond my limits, my knowledge and my skills. Thank you for that breathtaking adventure, Koni and also ND, who surely also was involved in that decision. I would definitely not be who/where I am now, if it wasn’t for your insanely huge amount of trust that you poured into my life. As well as time and knowledge, encouragement, and the right amount of pushing me to go further. And further. And to not give up. I do not know or understand, how you would never stop believing in me. Watch the entire progress from 2015-2017.